The premium midsized SUV segment was booming in 2014, especially in the fourth quarter, when sales were up 25%, leading to a full-year increase of 11%. At close to 293.000 sales, the segment breaks its sales record and looks ready to easily blast through the 300.000 sales threshold in 2015. Leading the charge is the recently updated Volvo XC60, which flamboyantly takes the lead of the segment, for the first time ever in its 7-year long career. Volvo credits the increased popularity to its new generation of 4-cylinder engines, most notably the frugal diesel version, as the D4 engine accounts for more than one third of XC60 sales in Europe. The XC60 had a particularly strong fourth quarter, selling almost 20.000 units in three months time, enabling it to pass the Audi Q5 which had controlled of the segment since Q2 after the Range Rover Evoque took an early lead in the first quarter. The Q5 finished in second place for the third straight year, after leading for three years as well. An all-new Q5 won’t arrive until 2016, so it will be even harder to fight for the lead again this year. After an excellent first quarter, the Evoque has dropped back into third place, where it ended 2013 as well. With sales almost stable and a facelift (and the addition of a segment-first convertible) due after the summer, the Evoque should be able to continue its streak of 3 consecutive years above 50.000 sales. That leaves the leader of 2012 and 2013 and the model that started this segment more than a decade ago off the podium in fourth place with sales down 19%, after already dropping 15% the year before, despite a minor facelift in 2014. With no big updates pending, the X3 will face increased competition from behind, as the Mercedes-Benz GLK will be renewed in the second half of the year and will be renamed GLC. It will probably lose its square design which never really struck a chord with crossover buyers and should be able to improve Mercedes’ share of the segment. Also due this year is the replacement for the Land Rover Freelander, called the Discovery Sport. It will be the segment’s first (optional) 7-seater, and is expected to more than double the Freelander’s sales to almost 40.000 units without cannibalizing on the Evoque. That kind of volume could put the Discovery Sport in the top-4, depending on whether the X3 will continue to nosedive or stabilize. No matter what the competition does, Land Rover looks set to become the segment’s biggest brand in 2015. The three newcomers for 2014 are in places 7 through 9, with the Porsche Macan ahead of the BMW X4, with almost 15.000 sales in nine months and almost 11.000 sales in six months respectively. With supply of the Macan limited by production, and the X4 already outselling the Porsche in Q4, the BMW looks set to be the winner of this battle in 2015. But don’t discount the Lexus NX, which also sold almost 4.200 units in the fourth quarter, only 200 behind the Macan. With its hybrid engine and its polarizing design, it clearly resonates with European crossover buyers in this sizzling hot, but extremely competitive segment. In fact, the NX is Lexus’ most successful introduction ever, and should lift the brand to record sales levels in Europe. 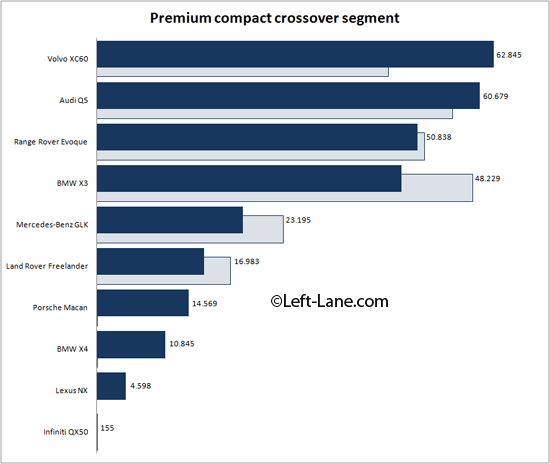 The premium compact SUV segment has grown at more than double the pace of the larger midsized SUVs, and should be able to finish 2015 north of 250.000 sales. 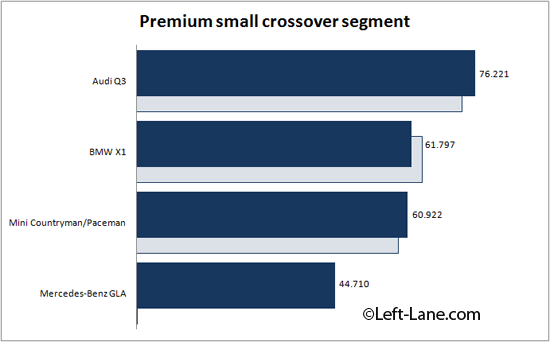 With existing models virtually stable at +1,3%, the newcomer Mercedes-Benz GLA takes the credit for 95% of the segment increase. The GLA has connected with its competitors in the second half of the year, selling within 1.000 units of the second place in Q3 and Q4 combined, although the leader Audi Q3 remains untouchable for any of the other models for now. The little Audi improves its sales record for the third time in a row since it was launched, increasing its lead over the inventor of the segment, the BMW X1. With a facelift of the Q3 in the beginning of this year, and an all-new X1 due in the second half, the battle is on for 2015. Similar to the Q3, the Mini Countryman and Paceman have managed to increase their sales in each of the four years since their introduction, topping 60.000 sales for the first time and showing no sign of a slowdown. For 2015, this segment will be a four-horse battle for the lead, although I think the Q3 will come out on top again, but for places 2 through 4, everything is possible. One thing’s for sure: the segment as a whole will continue to grow.